Feature splash-backs, backboards, and hob-panels compliment a wide variety of worktops and are a practical alternative to tiling, cost effective and easy to install and maintain, splash-backs are becoming an ever popular choice over tiling. This category comprises glass splash-backs, metallic laminates, fitting and installation accessories including Bushboards splash-back installation system for truly professional results. 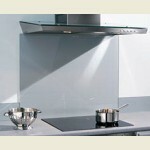 Worktop decor matched splash-backs and hob panels are in the worktop categories.